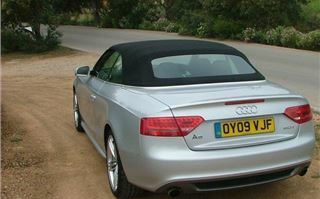 Road Test of the Audi A5 Cabriolet By Martin Gurdon. 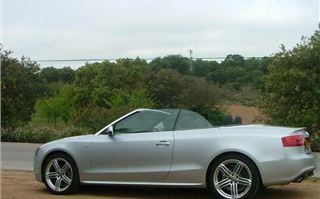 Convertibles were often cash cows for their makers; cars that could be built for a long time and sold at a premium. 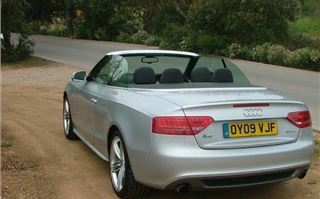 Styling is familiar but modern, and Audi is again making a virtue of sticking with a traditional canvas roof rather than going for the folding steel jobs which everyone from Peugeot to BMW favours. Although not as thief proof (although the car has just won a security award), Audi’s canvas top is lighter and takes up less space when electrically folded away - something it achieves in about 15 seconds. 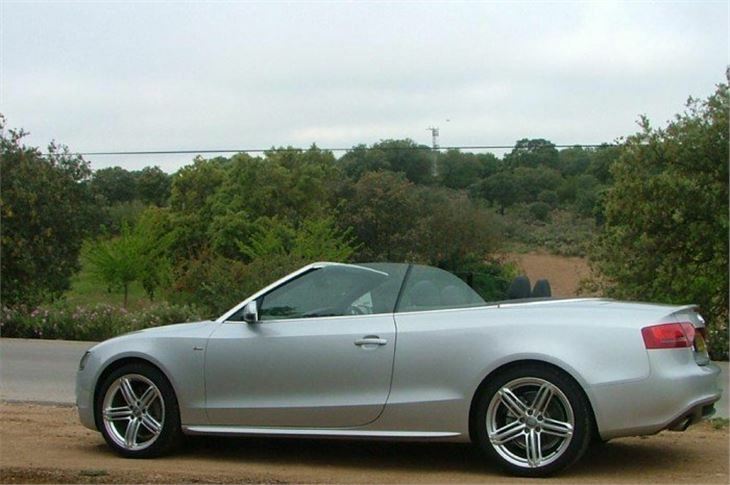 It can be raised on the move at speeds up to 30 mph, and certainly looks elegant. At motorway speeds there’s a little wind noise with the roof closed, but there’s no drumming or flapping about, and the interior becomes rather cocoon-like. Lower it and the front seat occupants get little in the way of wind buffeting at town speeds, although at higher velocities on a cold day might chill their ears somewhat, despite sitting low in the cabin. As for passenger space, it will seat four adults, but those in the back will have a cramped time, and even smallish children will find the rear compact and bijou. 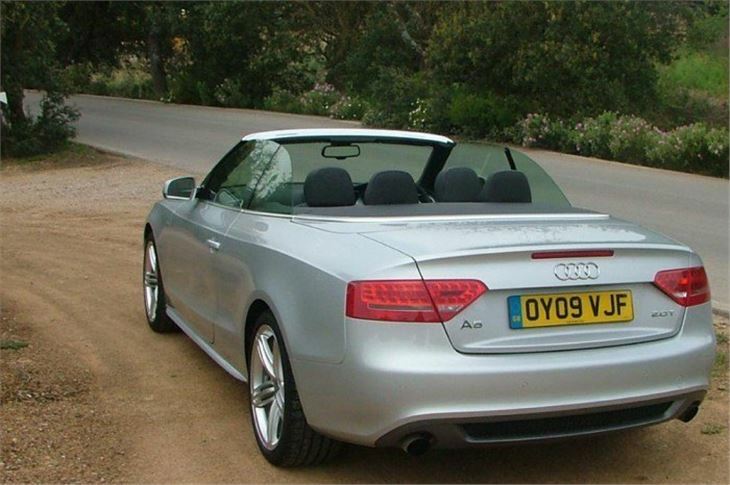 Ultimately, the A5 cabrio is an occasional four seater. The open body is commendably stiff, with only really poor surfaces inducing mild shake, and the cars ride comfortably and pliantly – on some plusher versions the suspension is adjustable. All the controls are light. This is something that applies to the steering which is accurate, precise but not especially engaging. Likewise the handling, although smaller engined, two wheel drive versions felt slightly lighter on their feet. Either way, the A5 cabriolet has been engineered for relaxed touring, rather than mad screeching about. There will be a variety of drive trains (two and quattro four-wheel-drive), with a mix of four and six-cylinder petrol and diesel variants. 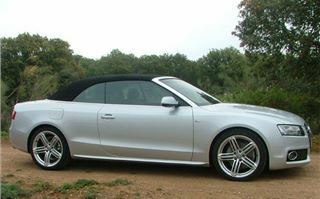 We were given two-litre petrols and 3.0 litre, six-cylinder diesels, and tried the first in two-wheel-drive, six-speed manual guise (there’s also a CVT automatic) and the diesel with all-wheel-drive and a two pedal, 7-speed twin-clutch transmission. This was very smooth but sometimes needed time to make its mind up. The ‘little’ petrol engine is more than up to the task of propelling this heavy vehicle. It never feels strained, is responsive to the throttle and doesn’t become course, even when revved hard, and is well suited to the car. 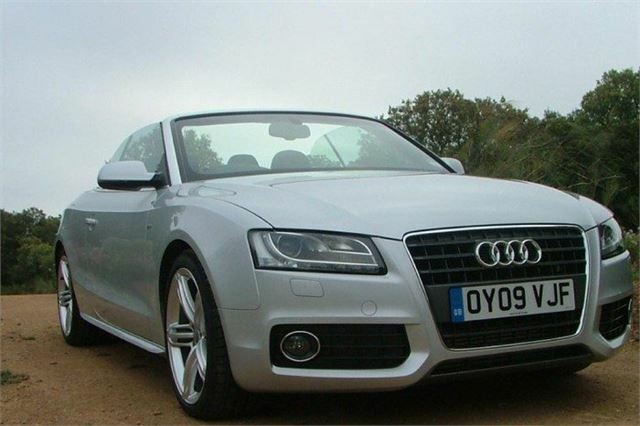 The diesel has the easy torque, or pulling power, you’d expect. It feels a bit like hauling a mixing spoon out of a bowl of treacle, and the car accelerates like a small locomotive. It’s said to reach 62 in 6.4 seconds and run out of puff at 153mph, in the process chucking out 179g of CO2 and consuming on average a gallon of diesel very 33 miles. The minor controls confirm to the usual ergonomic norms and are entirely twit-proof to use, and the cabins of all the cars we drove had a classy ambience, and were impeccably tasteful. All the plastics and mouldings felt expensive and were easy on the eye. You won’t find anything in the way of cheapness with the rest of the cabin’s fixtures and fittings. The only items which felt slightly flimsy were the retractable plastic arms which present the car’s front seat occupants with their seatbelts, although these did flag up the attention to detail that has gone into these cars. Mind you, none of this engineering density comes cheap. Buy one of the almost range-topping S-line versions and load it with some options (including heated seats, which you’d think would be standard on an expensive convertible) and you won’t get a lot of change from £50k. For those who still might regard the rival BMW 3-Series convertible as a bit too brash, and prefer the rather stylish canvas roof to something made from steel and glass panels, the Audi will have a lot of appeal. It’s well made, civilised to use and discreetly upper crust. As the late Kenny Everett might have said, "it’s all in the best possible taste."